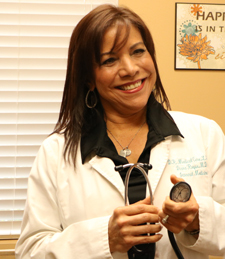 For over 25 years, Dr. Diana Roque has been practicing internal medicine and developed an overwhelming interest in women’s health and preventative medicine. Daily, Dr. Roque would treat patients that struggle with preventable diseases including diabetes, hypertension, and heart disease — the solution was Divine Weight Loss. Centered in the heart of Riverview, Florida, Divine Weight Loss is a medically-assisted weight loss clinic that helps you lose the weight the healthy way. Our Ultimate HCG or b12 Weight Loss programs will give you the healthy and visible results you desire. It is not recommended to do our HCG Program until after 6 month post delivery. It is not recommended for nursing mothers to do the HCG shots or appetite suppressants. Schedule an Appointment with Divine Weight Loss in Riverview, FL Today! For more information about our HCG Weight Loss program or our B12 Weight Loss program visit our Riverview clinic, schedule an appointment here, or call us at (813) 671-7570. We can help with your weight loss goals.